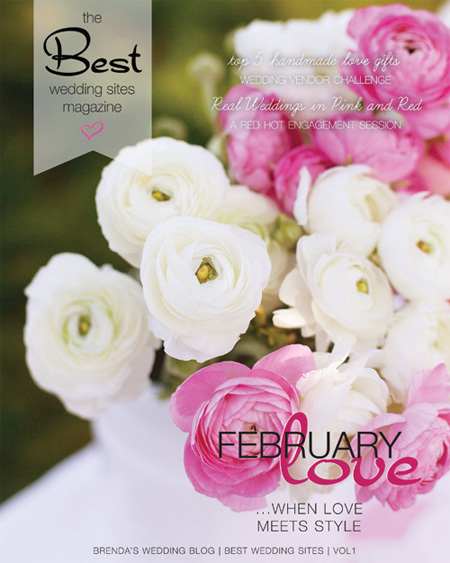 We are excited to be a part of the first issue of Best Wedding Sites Magazine! Check out our featured wedding on pages 22-23. In honor of the month of February, the issue is all about sharing love with your special someone as well as with your guests. You’ll also find inspiration from red and pink color palettes. Our featured article showcases our photos of Kate and Ge’s Las Vegas wedding. 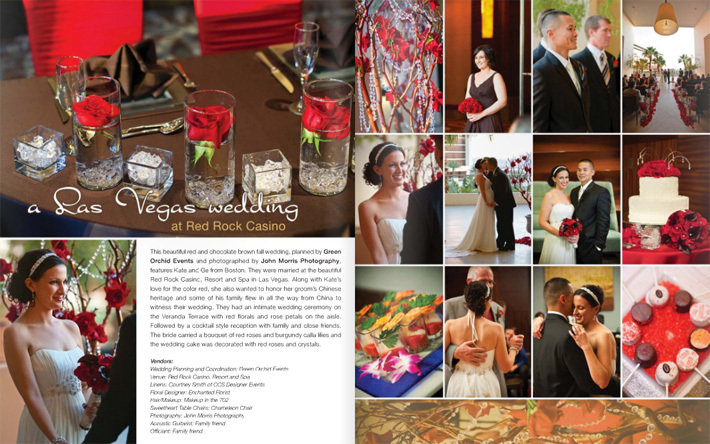 They are a wonderful couple from Boston who got married at the Red Rock Casino Resort & Spa. Kate looked absolutely stunning as she walked down the aisle. Her hair and makeup, provided by Makeup in the 702, looked just the way she envisioned. The wedding was beautifully decorated in rich hues of red and chocolate brown. Kate chose red not only because it’s one of her favorite colors, but also because she wanted to honor her groom’s Chinese heritage. Several of his family members flew in all the way from China to share in their celebration! In Chinese culture, red is considered a lucky color and a symbol of joy and good fortune, so it is traditionally used in wedding celebrations. While the choice of color was traditional, the wedding was anything but. Everything from the chic ceremony on the Veranda Terrace to the cocktail style reception was elegant and modern. The linens, provided by CCS Designer Events, combined with the beautiful floral by Enchanted Florist transformed the space into an intimate, romantic setting. Thanks to careful planning and coordination by Green Orchid Events, everything went off perfectly and it was an unforgettable event for the happy couple.